Enjoying The Story – Nomadic Gamers, eh! 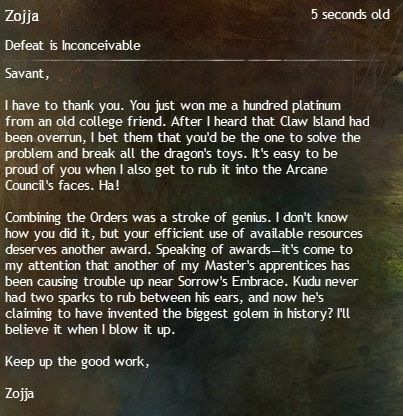 I love the little details I find in Guild Wars 2, like the random mail I get from my old Asura mentor, Zojja. She’s always keeping me updated on what’s going on with her, and she’s never forgotten any of my own deeds, no matter how far from home I may be when I’ve accomplished them. Makes my little Velours a bit home sick, to be honest. She hasn’t been ‘Savant’ for quite some time, now she’s called Commander. I wish there were more ‘stories’ within the game that didn’t rely quite so heavily on GW1 lore, because I haven’t explored everything GW1 has to offer (yet). It’s on my list of things to do (along with a number of other things, that list seems to be growing longer every single day). By stories I don’t mean that everyone doesn’t have their own little one, they do, but I wish my character felt more connected to the world as a whole aside from her personal story that I follow through the zones. That’s what I’ve been working on lately, her personal story along with finishing off the 70-75 zones, except there are a few skill points that are currently bugged. Hopefully they get fixed before too long (I’ve heard loads of people complaining about this in the map channel). A lot of people that I know have been busy with alts – and I find myself a bit of an outsider this time around because while I am normally the queen of alts (I have a VERY long list of them) I have felt no inclination this time around to play one what so ever. I tried playing a few of them off and on, but none are above level 3 at this time. I’m still just too involved with my little guardian. I don’t know how much longer that will last, but I’m enjoying it while it does, that’s for sure! As always, happy gaming, no matter where you find yourself! Haven’t felt much a need to play the alts too besides the odd curiosity about their personal storylines and get the occasional craving for melee. But for the most part I have only been bringing out the alts if a friend of mine wants to do his personal storyline with one of the characters and I have a low level one who also needs to do it. I love those little notes you get. I tried to keep mine but it seems as if they expire after a while. :( I should have taken pictures of them so I could have them because that kind of thing is very important to me. Oh wells. You live you learn your next character has it better lol. I’ve dabbled in a few alts but most are set up for birthday gifts. I’ll play them eventually but right now I’m focused on my necromancer. I’ve had vacation off and on for the past two weeks so I wanted to make sure I could get her as high as possible before I had to go back to work. I got her to 67 last night thanks to some crafting and 35% of the map complete. Woots. This next bit is spoilerish and I hope its ok that I post it here. If its not please feel free to delete this comment. I wish that we had a chapter of missions with Trahearne and our order mentor before Claw Island. If I remember right we only have 2 missions with him before Claw Island. I would have liked more and with our mentor coming along so I could really see the importance of the character. They mention he gets along with all the orders and I get a tid bit of information on him from my order but to me he was just some dude standing around when I first get to Claw Island. I feel no attachment to him like I did my mentor.